Over half a century after launching therapy for treatments, phytochemicals have become an important part of drugs. Actually, 70% of drugs approved between 1940 and 2002 are either natural products or have been developed based on knowledge gained from natural products. India has a rich cultural heritage of traditional medicines which includes Ayurveda, Homeopathy and Siddha system of medicines. Plants are the basic source of medicines in all these systems. A significant number of modern pharmaceutical drugs are thus based on or derived from medicinal plants.,Premna integrifolia Linn. (Araṇī or Agnimantha) is an important constituent of ten herb formulation, known as “Daśamūla”, widely used for treating various ailments in Indian system of medicine. There is an inherent difference within the three Ayurvedic Formulary of India (AFIs) published with regard to the botanical sources of Agnimantha. Thefirst edition (Part I) mentions Clerodendrum phlomidis Linn.f. as the authentic botanical source and Premna integrifolia Linn. as well as Premna mucronata Roxb. as substitutes. However, in the second edition of Part I, P. integrifolia has been mentioned as the authentic plant source and C. phlomidis as well as P. mucronata are provided as the substitutes. In Part II of thefirst edition of AFI on the other hand, C. phlomidis. Linn.f. has been listed as the authentic Agnimantha and Premna obtusifolia R. Br as well as P. mucronata Roxb. are listed as the substitutes. 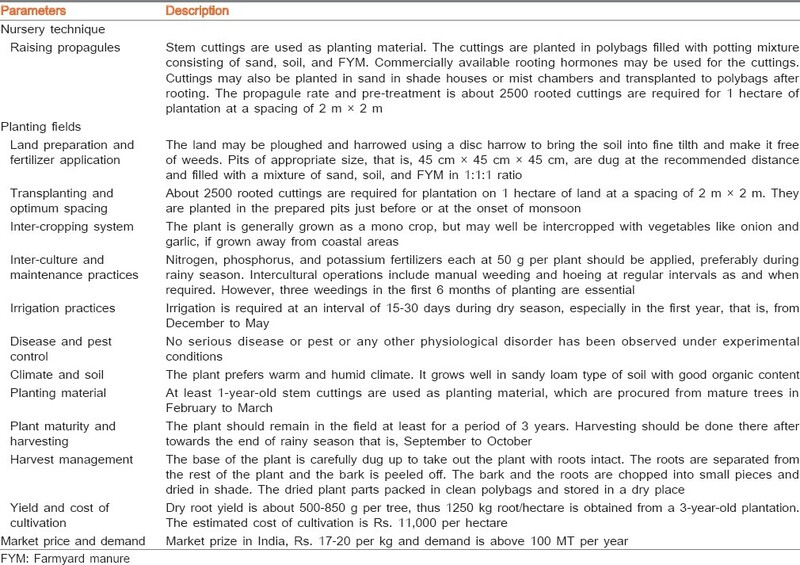 Hence, the basis for this variation in listing of botanical sources for Agnimantha is not provided and hence not clears. Its root extract is an active ingredient of many Ayurvedic preparations like, Ariṣṭam, Avaleham, Kvātham, Ghṛtam and Tailam.P. integrifolia is very important plant during Vedic period where in its stem and sticks were used to produce fire. This review is providing the systematic information on ecological biodiversity, traditional uses and phytochemistry of the P. integrifolia. P. integrifolia is a scandent, erect shrub or small tree, more or less thorny on the trunk and large branches. It is large shrub or small tree up to 10 m tall, bole up to 30 cm in diameter, much-branched and sometimes spiny, bark fissured-flaky, brownish-grey and branches are spinous usually. Fruits are drupe, black coloured, obovoid– globose, 3-6 mm long, green turning black, pear shaped, its endocarp being ridged, bony, and 4-celled. Fruits appearing in Aug.–Sept. Flowers having pedicel 0–0.5 mm long, dense corymbs, corolla greenish white with unpleasant smell or disagreeable odour, in terminal pubescent paniculate corymbose cymes, bracts minutes, lanceolate. Calyx 2.5 mm long, thick, glabrous, 2-lipped, one lip 2-toothed, and the other sub entire. Corolla is glabrous outside, tube 3 by 2 mm, cylindrical, hairy inside of the throat, lobes are four in number, oblong, rounded, 1.2 mm long. Stamens slightly exerted filaments hairy at the base. Ovary and style is glabrous, stigma of 2 equal divaricate lobes. Flowering occurs in April–June. Leaves are 5–9 by 3.2–6.3 cm, broadly elliptic, oblong or ovate, obovate to sub-orbicular, obtuse, very shortly acuminate, glabrous, and entire or the upper part dentate, base rounded or sub-acute, main nerves 4–5 pairs, petioles 1–1.6 cm long. Seeds are pear-shaped and oblong. Roots are yellowish brown in colour, woody, branched and somewhat tortuous to cylindrical in shape. Surface gets exfoliated easily and shows prominent longitudinal striations and wrinkles. Roots possess bland taste and slightly aromatic odour. The transverse section of P. integrifolia root shows rhytidoma made up of 15–20 layers of interrupted cork and 2–3 layers of cortex containing small stone cells packed with calcium oxalate prisms. Stone cells are pitted and show thickening on three sides. Inner cork is made up of about 8–10 layers of thin walled tangentially elongated suberised cells. The cortex is made up of collenchymatous parenchyma and shows a single discontinuous layer of elongated lignified, thick walled stone cells (80–125 µ) lodged with 3–5 prisms of calcium oxalate (16–30 µ). Phloem is comparatively wide and parenchymatous. The elements of wood occur in thin radial wedges. Xylem vessels are small (50–138.1 µ) and numerous. Medullary rays are 1–4 seriate, lignified and pitted. Starch (8–30 µ) is found in cortex, phloem and xylem. Powder of root of P. integrifolia is brown in colour having slight aromatic odour and bland taste. Starch is simple, spherical and cup shaped with distinct hilum. Stone cells are small, rectangular to oblong in shape and lodged with prisms, which are found scattered also.,,,,, The photograph of P. integrifolia with its various parts as shown in [Figure 1]a,[Figure 1]b,[Figure 1]c,[Figure 1]d,[Figure 1]e]. It is growing near western sea coast from Bombay to Molucca, Malaysia, Sri Lanka, Andaman and Nicobar. It is also found in forest of South India and West Bengal (Northern part). Moreover, it is also recorded as occurring in the plains of Maharashtra, Gujarat, North Karnataka, Assam, Khasi hills and Tarai. In Orissa, it is found on land periodically covered by tides in Mahanadi delta.,,,, Geo-graphical distribution map of P. integrifolia in India as shown in [Figure 1]f.
Ecological biodiversity have been required for better cultivation and farming of P. integrifolia. The details are enlisted as shown in [Table 1]. Kochoi is a local patent preparation is claimed to benefit tuberculosis. Polyherbal Ayurvedic preparations containing P. integrifolia are enlisted in [Table 2], which includes preparation name, therapeutic use and description. P. integrifolia have reported to contains p-methoxy cinnamic acid, linalool, linoleic acid, β-sitosterol and flavone luteolin, iridoid glycoside, premnine, ganiarine and ganikarine, premnazole, aphelandrine, pentacyclic terpenebetulin, caryophellen, premnenol, premnaspirodiene, clerodendrin-A, three diterpenoids namely 1β,3α,8β-trihydroxy-pimara-15-ene, 6α, 11, 12, 16-tetrahydroxy-7-oxo-abieta-8, 11, 13-triene, 2α,19-dihydroxy-pimara-7,15-diene, etc., phytoconstituents in its different parts, which are responsible for its actions. The fluorescence analysis of stem-bark and stem wood of P. integrifolia will be helpful in the standardization of the drug in crude form and to distinguish the plant from its related adulterants. Exploration of chemical constituents is required for establishing mechanisms of action of possible markers and structure-activity-relationship among the constituents present in the root, stem-bark and leaves which will give us the basis for its therapeutic use. P. integrifolia can be used as a good source of active therapeutics. This therapeutically important medicinal plant is not present in the Ayurvedic Pharmacopeia of India and it should be incorporated therein. In Indian market, there are many Ayurvedic preparations containing P. integrifolia that are widely utilized for curing various ailments. Therefore, it is also important to have the study of this plant incorporated into the syllabus of undergraduate and postgraduate pharmacy courses. These studies will be helpful for the development of active molecules and clinical trials a tool for development of Ayurvedic formulations. Depending on the primary information available on, this plant, the isolation and identification of active constituents, modern pharmacological evaluations on isolated compounds and their toxicity testing is to be explored. There is no patent so far on P. integrifolia. Thus, this review provides an easily accessible source of ecological biodiversity, traditional uses and phytochemistry of P. integrifolia. Logani MK, Davies RE. Lipid oxidation: Biologic effects and antioxidants – A review. Lipids 1980;15:485-95. Laloo D, Sahu AN, Hemalatha S, Dubey SD. Pharmacognostic and phytochemical evaluation of Cinnamomum wightii Meissn. flowers. Indian J Nat Prod Res 2012;3:33-9. Efron DH, Holmstedt B, Kline NS. Ethno-pharmacologic Research for Psychoactive Drugs. New York: Raven Press; 1979. Schultes RE, Swain T. The plant kingdom: A virgin field for new biodynamic constituents. In: Fina NJ, editors. The Recent Chemistry of Natural Products Including Tobacco. New York: Proceeding of the Second Philip Morris Science Symposium; 1976. p. 133-71. Husain A, Virmani OP, Popli SP, Misra LN, Gupta MM, Srivastava GN, et al. Dictionary of Indian Medicinal Plants. New Delhi: Central Institute of Medicinal and Aromatic Plants; 1992. p. 375. Aparna S, Ved DK, Lalitha S, Venkatasubramanian P. Botanical identity of plant sources of Dasamula drugs through an analysis of published literature. Anc Sci Life 2012;32:3-10. Formulary – Single Drugs. List of single drugs of plant origin. The Ayurvedic Formulary of India. Part 1. 1st ed. New Delhi: Government of India, Ministry of Health and Family Welfare, Department of Indian Systems of Medicine and Homoeopathy; 1978. p. 241-59. Formulary – Single Drugs. List of single drugs of plant origin. The Ayurvedic Formulary of India. Part 1. 2nd ed. New Delhi: Government of India, Ministry of Health and Family Welfare Department of Indian Systems of Medicine and Homoeopathy; 2000. p. 307-30. Formulary – Single Drugs. List of single drugs of plant origin. The Ayurvedic Formulary of India. Part 2. 1st ed. New Delhi: Government of India, Ministry of Health and Family Welfare Department of Indian Systems of Medicine and Homoeopathy; 2000. p. 327-40. George KV, Samuel KA, Abraham J, George BP. Investigations on bioactive compounds of Premna integrifolia Linn; 2008. Available from: http://www.forestry.caf.wvu.edu/wvu_woodscience/bdawson/web_bibu/Premna.pdf. [Last accessed on 2008 Feb 10]. Chunekar KC. Illustrated Dravyaguna Vijnana. 2nd ed., Vol. 2. Varanasi: Chaukhambha Orientalia; 2005. p. 418-21. Thirumalai D, Paridhavi M, Gowtham M. A phytochemical review of Premna species. 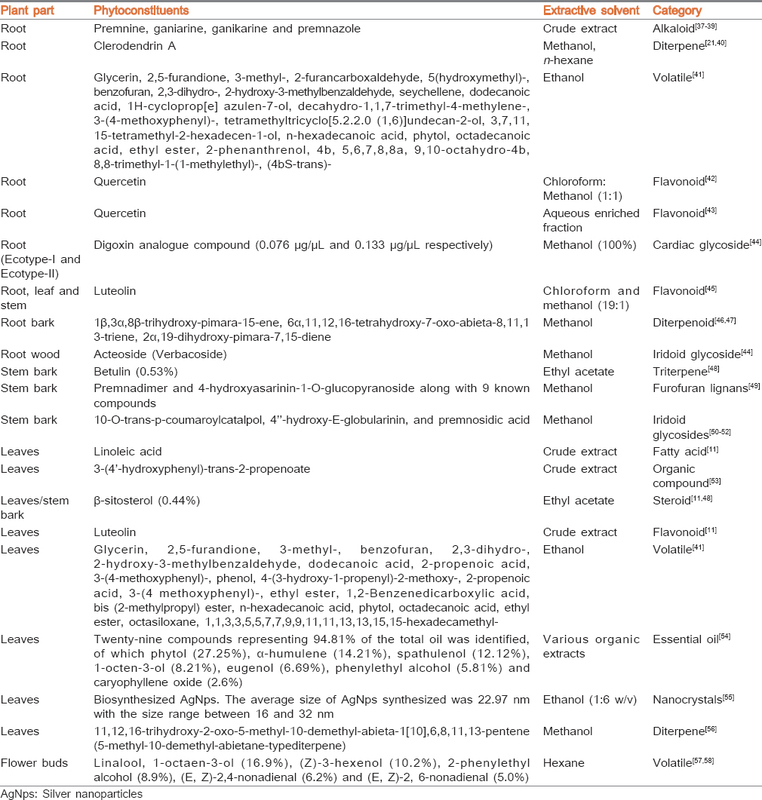 Int J Res Phytochem Pharmacol 2011;1:196-200. Govaerts R, Paton A, Harvey Y, Navarro T. World checklist of Limiaceae. Kew: The Board of Trunsteens of the Royal Botanic Gardens; 2008. 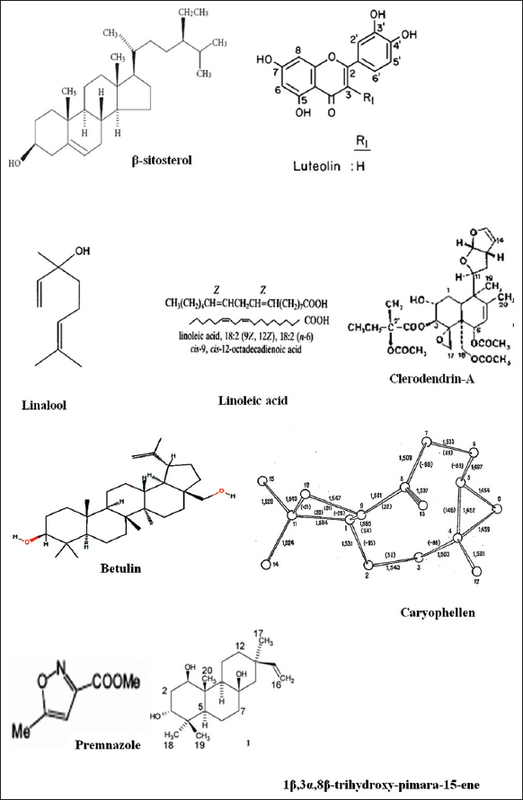 Daniel M. Medicinal Plants: Chemistry and Properties. New York: Science Publishers; 2006. p. 53. Shah GL. Flora of Gujarat State. Part-II. Vallabh Vidyanagar: Sardar Patel University; 1978. p. 563. Caldecott T, Tierra M. Ayurveda: The Divine Science of Life. New York: Elsevier Health Sciences; 2006. p. 161-2. Anonymous. Agro-techniques of Selected Medicinal Plants. Available from: http://www.assamagribusiness.nic.inMAP2.pdf. [Last accessed on 2011 Dec 29]. Nadkarni KM, Nadkarni AK. Indian Materia Medica. 3rd ed., Vol. I. Bombay: Popular Prakashan; 2005. p. 1009-10. Kirtikar KR, Basu BD. Indian Medicinal Plants. 2nd ed., Vol. III. Dehradun: International Book Distributors; 1996. p. 1927-9. Anonymous. The Wealth of India, A Dictionary of Indian Raw Materials and Industrial Products. Vol. III. New Delhi: Central Institute of Medicinal and Aromatic Plants; 1998. p. 204. Gokani RH, Kapadiya NS, Shah MB. Comparative pharmacognostic study of Clerodendrum phlomidis and Premna integrifolia. J Nat Remed 2008;8:222-31. Anonymous. Medicinal Plants in Papua New Guinea. Available from: http://www.wpro.who.intNRrdonlyres1EA13AB9-91B2-4E42-BCC59CDADE00D91A0Part 2_MedicinalPlantsinPNG.pdf[Last accessed on 2011 Dec 29]. Warrier PK, Nambiar VP. Indian Medicinal Plants. Madras: Orient Longman; 1997. p. 348-52. Mali PY, Bhadane VV. Comparative account of screening of bioactive ingredients of Premna integrifolia Linn. with special reference to root by using various solvents. J Pharm Res 2010;37:1677-9. Anonymous. The Ayurvedic Pharmacopoeia of India, Formulations. Part II. 1st ed., Vol. I, 13-16. New Delhi: Government of India, Ministry of Health and Family Welfare, Department of Ayurveda, Yoga and Naturopathy, Unani, Siddha and Homoeopathy (AYUSH); 2007. p. 65-70. Sturtevant EL. Sturtevant&#39;s Edible Plants of the World. New York: Dover; 1972. Kumar V, Jain SK. Plants products in some tribal markets of central India. Econ Bot 2002;56:242-5. Anonymous. Review of Ayurvedic Medicines-Herbs and Foods, Ayurveda in Nepal, The teaching of Vaidya mana Bhijra Bajracharya (Dr. Mana) of Kathmandu. Available from: http://www.ayurvedainnepal.com/medicine/review-of-ayurvedic-medicines-herbs-and-foods/. [Last accessed on 2014 Mar 13]. Rajendran R, Krishnakumar E. Anti-arthritic activity of Premna serratifolia Linn. Wood against adjuvant induced arthritis. Avicenna J Med Biotechnol 2010;2:101-6. Rajendran R, Suseela L. Pharmacognostical studies on Premna serratifolia Linn. (Verbenaceae). Int J Phytomed Relat Ind 2010;2:169-74. Chopra RN, Chopra IC. Chopra&#39;s Indigenous Drugs of India. 1st ed., (3rd Reprint). Kolkata: Academic Publisher; 2006. Anonymous. Divya Pharmacy, Diya Yog Mandir (Trust), Kankhal, Haridwar, Uttarakhand, India. Available from: http://www.divyayoga.in/contents/cs/p73_DASHMOOL_KWATH_-100GM.html. [Last accessed on 2013 Mar 11]. Anonymous. Available from: http://www.ayurvedauk.com/index.php?page&#61;shop.product_details and category_id&#61;6 and flypage&#61;flypage.tpl and product_id&#61;93 and vmcchk&#61;1 and option&#61;com_virtuemart and Itemid&#61;69. [Last accessed on 2013 Mar 11]. Anonymous. Siddha Medicine, Sacred Medicine Sanctuary, Poulsbo, Washington. 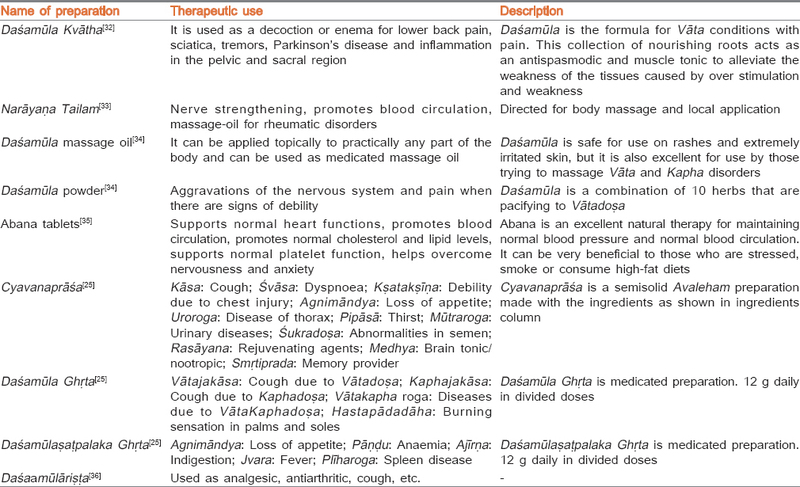 Available from: http://www.siddhamedicine.doṣabalance.com/siddha_members/dashmool.php. [Last accessed on 2012 Oct 28]. Anonymous. Preparation of Kwath and Dashmulakwath. Bangladesh National Formulary of Ayurvedic Medicine; 1992. p. 20-32. Basu NK, Dandiya PC. 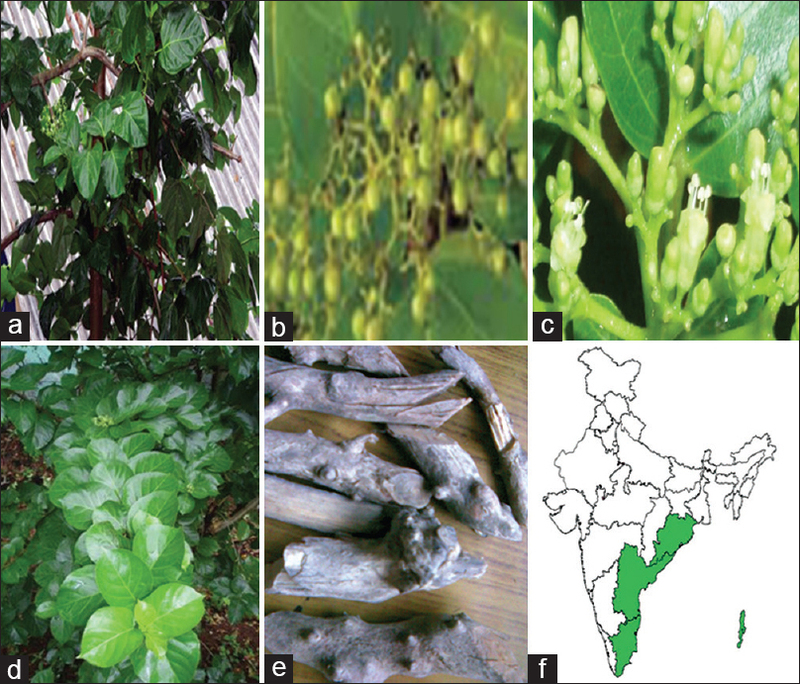 Chemical investigation of Premna integrifolia Linn. J Am Pharm Assoc 1947;36:389-91. Basu NK, Joneja AN. Chemical investigation of Premna integrifolia. Indian J Pharm 1949;11:191-3. Barik BR, Bhowmik AK, Dey AK, Patra A, Chatterjee A, Joy S, et al. Premnazole, an isoxazole alkaloid of Premna integrifolia and Gmelina arborea with anti-inflammatory activity. Fitote 1992;63:295-9. Gokani RH, Shah MB. Isolation and estimation of Clerodendrum phlomidis and Premna integrifolia root. J Pharm Res 2009;8:9-11. Singh CR, Nelson P, Muthu K, Pargavi B. Identification of volatile constituents from Premna serratifolia L. through GC-MS. Int J PharmTech Res 2011;3:1050-8. Mali PY, Bigoniya P, Panchal SS, Muchhandi IS. Anti-obesity activity of chloroform-methanol extract of Premna integrifolia in mice fed with cafeteria diet. J Pharm Bioallied Sci 2013;5:229-36. Mali PY. Effect of aqueous enriched fraction of Premna integrifolia root against cafeteria diet induced obesity in Swiss albinomice. Int J Green Pharm 2013;7:315-21. Bose LV, George KV, Iyer RS, Deepa TD. Identification of novel cardiac principle in the roots of Premna serratifolia L. J Pharm Res 2012;5:3261-4. Singh CR, Nelson P, Boopathy S. In-vitro conservation and protective effect of Premna serratifolia Linn. – An important medicinal tree. Int J Pharm Appl 2012;3:332-43. Yadav D, Tiwari N, Gupta MM. Diterpenoids from Premna integrifolia. Phytochem Lett 2010;3:143-7. Yadav D, Tiwari N, Gupta MM. Simultaneous quantification of diterpenoids in Premna integrifolia using a validated HPTLC method. J Sep Sci 2011;34:286-91. Phyu MA. Isolation and structural identification of betulin and related compounds from stem bark of Premna integrifolia Linn. Meiktila (Myanmar): Department of Chemistry, Meiktila University; 2006. [Thesis]. Available from: http://www. http://meiktilauniversity.blogspot.in/2015/07/department-of-chemistry.html. [Last accessed on 2015 Aug 25]. Yadav D, Masood N, Luqman S, Brindha P, Gupta MM. Antioxidant furofuran lignans from Premna integrifolia. Ind Crops Prod 2013; 41:397-402. Yadav D, Gupta M. Isolation and HPTLC analysis of iridoids in Premna integrifolia, an important ingredient of ayurvedic drug Dashmool. J Planar Chromatogr 2013;26:260-6. Shukla V, Yadav D, Phulara SC, Gupta MM, Saikia SK, Pandey R. Longevity-promoting effects of 4-hydroxy-E-globularinin in Caenorhabditis elegans. Free Radic Biol Med 2012;53:1848-56. Shukla V, Phulara SC, Yadav D, Tiwari S, Kaur S, Gupta MM, et al. Iridoid compound 10-O-trans-p-coumaroylcatalpol extends longevity and reduces a synuclein aggregation in Caenorhabditis elegans. CNS Neurol Disord Drug Targets 2012;11:984-92. Rahman A, Sattar MA. Antioxidant Properties of Essential oil and Organic Extracts of Premna integrifolia Linn. International Conference and Exhibition on Pharmaceutical Biotechnology. Hyderabad: Omics Group Conferences; 2011. Paul John JA, Selvi BK, Karmegam N. Biosynthesis of silver nanoparticles from Premna serratifolia L. leaf and its anticancer activity in CCl4-induced hepato-cancerous Swiss albino mice. Appl Nanosci 2015; 1-8. Available from: http://link.springer.com/article/10.1007/s13204-014-0397-z/fulltext.html. [Last accessed on 2015 Aug 25]. Habtemariam S, Varghese GK. A novel diterpene skeleton: Identification of a highly aromatic, cytotoxic and antioxidant 5-Methyl-10-demethyl-abietane-type diterpene from Premna serratifolia. Phytother Res 2015;29:80-5. Ky PT, Hang NT, My TT. Preliminary study on the chemical components in flowers of Premna integrifolia L. Tap Chi Duoc Hoc 2005;12:9-10. Teai T, Bianchini JP, Cambon A. Volatile constituents of flower buds concrete of Premna serratifolia L. J Essent Oil Res 1998;10:307-9.